Dozens of families accepted a painful honor in the name of their loved ones, firefighters who died from illnesses associated with their response to ground zero. Andrew Siff reports. The terror attacks of September 11, 2001 continue to kill people. Though 343 firefighters died that Tuesday, the FDNY now says an additional 159 firefighters have died due to illnesses associated with fighting the fires and attempting rescues at ground zero. That marks 501 FDNY firefighter deaths as a result of the attack, the highest 9/11 death toll of any first responder agency. 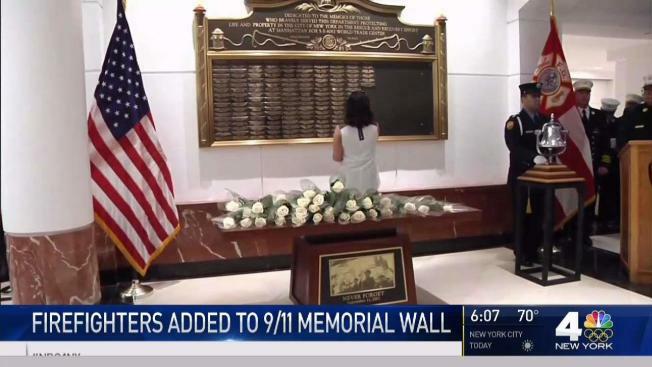 In a memorial dedicated specifically for firefighter deaths related to illnesses from responding to the World Trade Center on 9/11, the FDNY added 32 names on Thursday. In a somber and emotional ceremony, a family member of each of the 32 firefighters was escorted into FDNY headquarters, where they placed a white rose before a large bronze memorial wall with their family member's rank, assignment, name, and date of death listed. They wiped away tears as their loved ones' names were called, and a firefighter wearing white gloves rang a bell for each of the 32 names. "There are no words that will ease our pain and no promise that these losses will stop," FDNY Commissioner Daniel Nigro said. "We thought our pain and our loss could not grow," he said. "It is cruel and unfair what our families have had to endure." One of those families are the Alexanders. They lost Lt. Raymond Alexander almost a year ago. And then two weeks ago, they lost his son, Marine Engineer Robert Alexander, to illness associated with the attack as well. Lt. Alexander's son, also named Raymond, said of the last year, "It's been hell." He said his father was diagnosed with seven different types of cancers when he died. Ginger Alexander, Lt. Alexander's wife and engineer Alexander's mother, choked back tears, saying, "I still can't believe my husband died, and now my son died just two weeks ago." Another name added to the wall was Lt. Edith E. Torres. Her brother, retired NYPD officer Jose Torres Jr., says Lt. Torres was off on 9/11 and responded to the World Trade Center after the attack. "There isn’t a day that goes by that we don’t think of her or talk about her," said Torres Jr. Since 2002, more than 16,000 firefighters who participated in rescue, recovery and cleanup operations at ground zero have been part of a comprehensive health screening and evaluation program by New York City and its medical institutions. The Center for Disease Control has identified digestive disorders, mental health conditions, musculoskeletal disorders, and certain cancers as being linked to the fumes, fires, and smoke from the World Trade Center site.